The WBC heavyweight champion defends his title against Fury on Saturday at Los Angeles' Staples Center in what is widely considered his most difficult challenge. Those that believe Fury will win do so because of his variety and boxing IQ, but by overcoming Cuba's Ortiz - a fighter Wilder believes possesses similar strengths - the American insists he learned how to win against an undefeated opponent who outfoxed even the great Wladimir Klitschko. 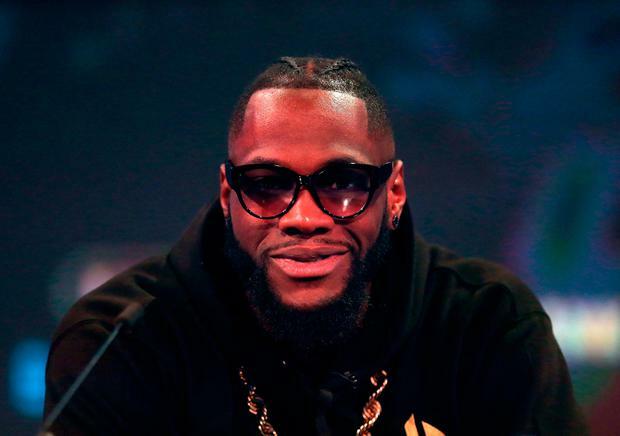 Wilder had to recover from a heavy knockdown before responding to stop the then highly-rated Ortiz in the 10th round, and even if he believes he will have to rely on figuring out Fury on fight night, he said: "Ortiz is more experienced; he's been fighting just as long as Fury, if not longer. "He's definitely got way more amateur experience - the Cubans, that's what they do. I've got so much confidence - I've knocked out the number two guy, and now I'm going for the number three. I'm not going to be denied. It's just a different height. "Fury's awkward; any awkward fighter is going to be a tough fight - it's one of those things when you just have to figure him out. If it's with a less awkward opponent you have a grasp of what you need to do to get to him; with an awkward fighter you really can't think about it."